Wine and beverage coolers are a great way to make sure that you are storing and serving your wine at the right temperature. 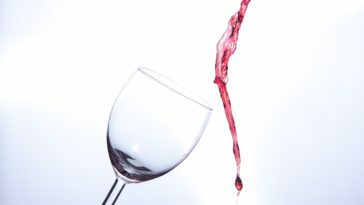 Wine served at the correct temperature will make for a more enjoyable dining experience for you and your guests. 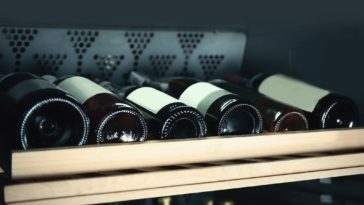 Whatever type of wine you are planning to serve, storing it at the ideal temperature is easy to do if you invest in a high quality and dependable wine and beverage cooler. Fortunately, there are many compact coolers to choose from, so you won’t have trouble finding one that meets your needs. If you have limited space, you might opt for a small cooler that fits under your kitchen counter. 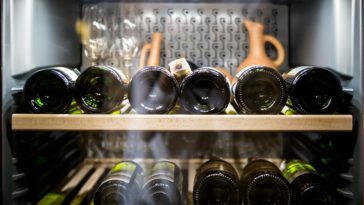 If you are a wine enthusiast with a significant number of bottles to store, you might want to choose a larger stand-alone model, but either way, you will enjoy drinking wine that is perfectly chilled. 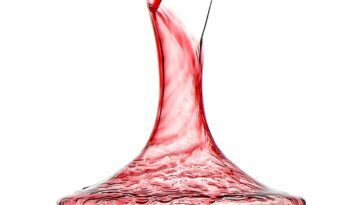 Other things to take into account when purchasing a wine and beverage cooler are price, features, style, temperature range, types of cooling systems, and the number of cooling zones. This article will provide you with information about the Magic Chef wine coolers in general and the brand. It will include detailed reviews of three specific Magic Chef wine fridges. Magic Chef is a dependable kitchen appliance company that has been operating for over 85 years. It began as a small tin shop in St. Louis Missouri and introduced the first temperature control device in 1914. The Magic Chef Wine Cooler Company was founded in 1992 and is based in Wood Dale Illinois. Magic Chef wine fridges offer a convenient and stylish way to store canned and bottled beverages. Magic Chef wine coolers are durable, ventilated, insulated, and have a sophisticated appearance. Interior lighting makes it easy to organize and select your wine. Magic Chef wine coolers come in a variety of sizes and styles. They offer dual wine and beverage coolers, countertop wine coolers, a portable cooler and a keg cooler. 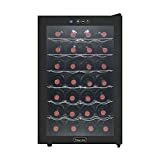 If you are looking for a wine cooler with red and white presets, Magic Chef’s 50-bottle cooler has convenient preset options to set the perfect temperature for your wines. The portable party cooler is a good choice for home or office use. This Magic Chef wine fridge includes two storage baskets that accommodate bottles and two foldout tabletops. Magic Chef wine coolers are competitively priced and can be purchased through major retailers. They are made from heat-resistant plastic and should be kept away from direct sunlight for best results. Check the company’s product page for more details. Magic Chef wine fridges come with a standard one-year limited warranty on parts and labor and five years on the compressor. Some models include additional warranties on parts. 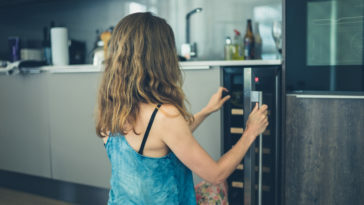 If you entertain frequently and are looking for a wine cooler for your home or your business that will keep your beverages at the right temperature, you should be able to find a Magic Chef wine fridge that meets your needs. Originally founded in 1929, Magic Chef is known for its easy-to-use small appliances and accessible customer service. Their wine and beverage coolers come in a choice of sizes and combinations to suit your needs. 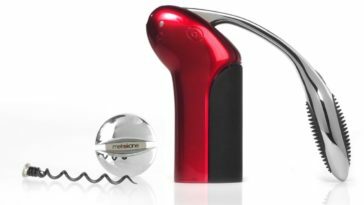 They are designed for short-term storage of wine for about one year and have electric controls to set the temperature that you desire. 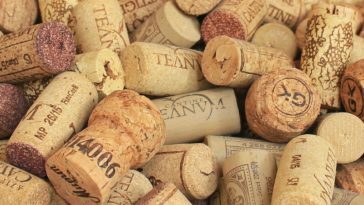 They are a great choice if you are looking for an inexpensive way to store your wine collection. 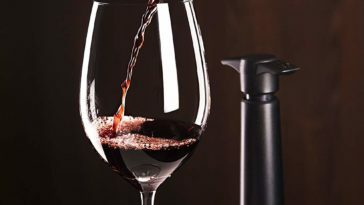 This detailed review of three Magic Chef wine coolers with pros and cons for each product will help you choose the one that is right for you. 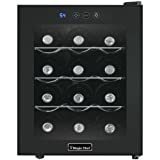 The Magic Chef 12-Bottle Single-Zone cooler is the best choice if you are looking for a compact and basic Magic Chef wine fridge that will fit in a small space or on your countertop and hold a decent amount of wine. Measuring 14.2 inches wide by 19 inches tall, and 20.1 inches deep, this reasonably priced Magic Chef wine cooler won’t take up too much room in your home or office. Featuring a black door, a black cabinet, and sculpted chrome shelves, this Magic Chef wine cooler will look great anywhere in your home or office. The thermoelectric cooling system is silent, vibration free, and energy efficient. 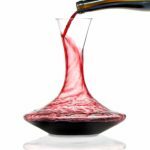 Its temperature ranges from 54 to 66 degrees Fahrenheit so it can be used to cool red or white wines to their ideal serving temperature. The electronic control panel has an LED display and interior lighting that will provide you with a great view of your wine collection and help you show it off to your friends. It is easy to adjust the temperature on this Magic Chef wine fridge. 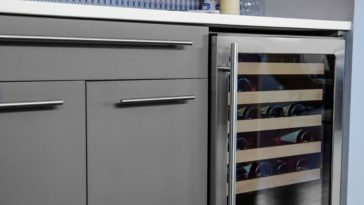 As a single-zone cooler, this Magic Chef wine cooler can only chill one type of wine at a time. It uses digital controls to adjust the temperature and a digital switch to turn the light on and off. There is no child safety lock, but Magic Chef wine fridges can be placed on a countertop out of children’s reach. This Magic Chef wine cooler comes with a one-year warranty. If you have a small collection of wine and not much space, this Magic Chef wine cooler is the ideal option. With its sleek design and modern look, you will be pleased to display this in your home. This Magic Chef wine fridge has a great temperature range, is less expensive than many other models, and is small in size. This small Magic Chef wine fridge is convenient, affordable, high in quality, and great for extra tight spaces. If you are just getting started collecting wines and don’t have much space, this Magic Chef wine fridge might be the best choice. 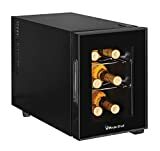 A six-bottle magic chef wine fridge will be perfect if you want to keep a small collection of wines, or if you have larger collection but you want to keep a few bottles close at hand. This compact Magic Chef wine fridge has a thermoelectric cooling system that is quiet and energy efficient, sculpted chrome shelves, and two removable wine bottle racks. The temperature settings on this Magic Chef wine cooler range from 46-64 degrees Fahrenheit. The compact size of this Magic Chef wine cooler is perfect for small spaces and countertop use. It measures 22.3 x 17.8 x 12.4 inches and weighs just 21.9 pounds. 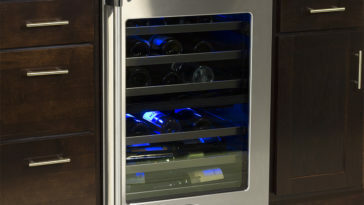 This Magic Chef wine fridge, which is affordable and attractive, holds standard size bottles. Removing one of the rows will allow it to accommodate larger bottles. The design of this Magic Chef wine fridge, with sleek black finish, will look great anywhere, and the insulated glass door allows you to display your collection to guests. 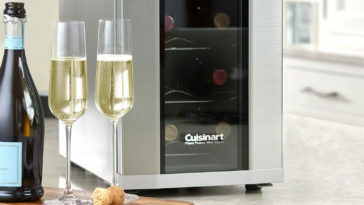 This Magic Chef wine fridge will fit on a counter top, on a small table, or just about anywhere in your home or office. 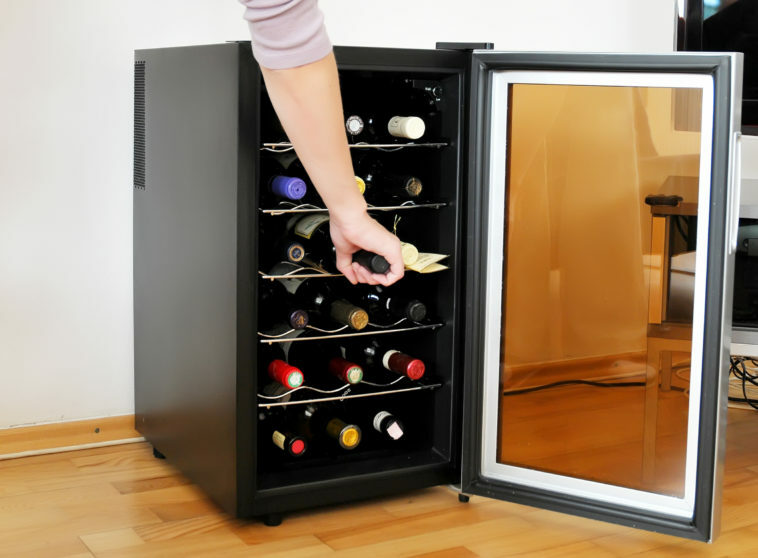 This Magic Chef wine fridge is convenient to use and sturdy. Its recessed handle is another great feature that will save space and make it easy to use. 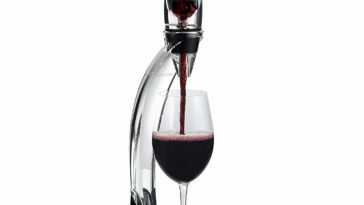 This Magic Chef wine cooler can hold 28-bottles, which makes it great for wine connoisseurs or businesses. It features quiet thermoelectric cooling technology based on the Peltier effect that is eco-friendly and vibration free and an electronic panel with soft white LED stage lighting. The temperature range is from 50 to 66 degrees Fahrenheit. 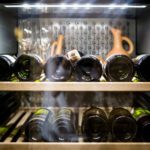 With six sculpted chrome shelves that are removable and an interior light, you will be able to display your wine collection and store it at the optimal temperature. This Magic Chef wine fridge measures 20.5 x 18.1 x 29.1 inches. 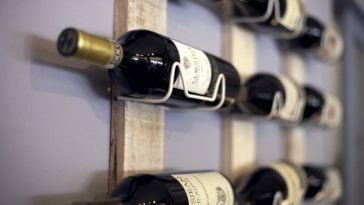 The racks pull out and accommodate regular size wine bottles. 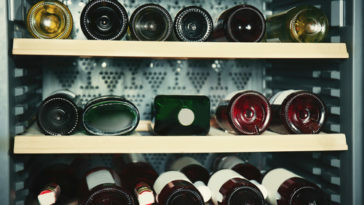 For wider bottles, the bottom rack can be removed. The contemporary design and all-black cabinet of this Magic Chef wine cooler will blend in nicely in any setting. The cooler operates easily and will fit just about anywhere. The blue LED display provides quick temperature readings is easy to see. This Magic Chef wine cooler is a great choice for a wine connoisseur with a medium-sized collection of wine.